A party of anti fracking campaigners who caused four days of chaos when they climbed onto vehicles visiting the controversial Cuadrilla drilling site in Little Plumpton have been jailed. The four men - soil scientist Simon Roscoe Blevins, 26, primary school teacher Richard Loizou, 31, and piano restorer Richard Roberts, 36, and Julian Brock, 47, are the UK’s first anti-fracking protesters to receive custodial sentences. The defendants blew kisses and looked close to tears as fellow protestors in the gallery burst into tune as they were led down. It is the first time in more than 80 years that laws around public nuisance have been used against environmental campaigners- the last being in 1932 after a protest in Derbyshire. Blevins and Roberts were found guilty of public nuisance after a trial and were jailed for 16 months, with co-defendant Loizau jailed for 15 months. Brock, who had admitted the charge, was given 12 months suspended for a 18 months and a rehabilitation activity. Their protest, which involved camping on top of four lorries and preventing all deliveries and vehicular movement to the A583 Preston New Road site, caused widescale disruption to businesses and residents for four days last July. Judge Robert Altham rejected submissions they had not realised the scale of their actions and said people's lives had been "criminally disrupted". He added: "No person who has any experience of life could fail to understand the effect of blocking a main carriageway between a city and a town, especially if they are on top of a lorry watching the disruption unfold." Preston Crown Court heard residents had suffered difficulties in access and egress to their homes through congestion and the effects on public transport. Businesses suffered loss of trade as well as inconvenience to customers and problems with deliveries and collections. And the lorry drivers, who became "sitting ducks for insults and intimidation", had been seen by their frightened families on TV coverage. The judge said the most "striking" evidence was that of an elderly disabled pensioner who relied on public transport and had to be dropped further from her home due to the traffic rerouting, taking her 90 minutes to struggle home. 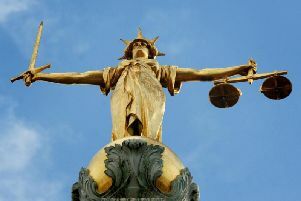 The case dates back to Tuesday, July 25 when a convoy of seven lorries were travelling from Immingham Docks towards Blackpool to the Cuadrilla site. They were carrying specialist drilling equipment hired specifically for the job, from the continent, by Cuadrilla. Prosecuting, Craig MacGregor said: "The police were warned about the imminent arrival of the convoy, about 15 minutes before its arrival on the Preston New Road, and tried to protect the route to the site by the use of police cars in front and behind the convoy a physical cordon of police officers outside of Maple Farm, where the protestors were camped. The court heard Lancashire Police’s Bronze Commander on the ground Inspector Hurt, who had the experience of hundreds of protests at and around the site, was used to people getting into the road to try and stop vehicles, whether by lying in the road, running into the road or slow walking in front of the vehicles. The convoy was stopped by othjer campaigners getting into the road, managing to get through the police cordon and bringing the lorries to a halt. At 8.06 the Roberts managed to get through the police cordon and climbed on top of the cab of the first lorry in the convoy and it could not then safely move without potential injury to him. Mr Loizou was also able to get through the police cordon and climbed on top of the cab of the last lorry, about 30m from the exit junction of Carr Bridge residential estate. The traffic on the A583, the main arterial road between Preston and Blackpool, which is used as a 'blue light route' by emergency services, was brought to a standstill in both directions. Mr MacGregor added: "As a result of this protest and the need to protect public safety and keep this major road open Insp Hurt called on one further PSU – the officers were taken from other front line duties.
" As a result of the road blockage there was ‘significant congestion’ and ‘increase in traffic queues’." The police put up diversions to re-route traffic from Peel Corner to Fox Lane Ends some 1 ½ miles apart. Traffic was backed up from the roundabout at the M55 right back onto the motorway. The road was still blocked at 3:18pm when Simon Blevins climbed on to a lorry stationary in the east bound lane. Footage of them dancing to music and pretending to surf on top the lorry cabs was played in court. Between 5pm and 6pm on July 25 July the police managed to get a contraflow running which allowed them to clear some of the traffic but traffic was backed up onto many other nearby roads. The first to come down was Loizou, 31, of Platt Lane, Manchester, after 45 hours and six minutes. Blevins, 25, of Andover Street, Sheffield came down having spent 73 hours and 27 minutes on the lorry. Roberts, of Upper Richmond Street, London, climbed down at 8:13pm on July 28 after 84 hours and 19 minutes. Brock, of Ellacombe Church Road, Torquay, came down after 76 hours and six minutes on a lorry. Judge Robert Altham said in January 2017 Cuadrilla was granted a licence to explore for shale gas at a site just off Preston New Road. He added: " Since that licence was granted that site has become a focus of those protesting against fracking in general." More than 80 fellow protestors attended Preston Crown Court as the hearing began on Tuesday. After the case campaigner Miranda Cox, from Kirkham, said: "It's unprecedented these charges were brought for public nuisance. "They have put their livelihoods and their futures on the line, they have shown solidarity with the people of Lancashire who have been fighting this for seven years."